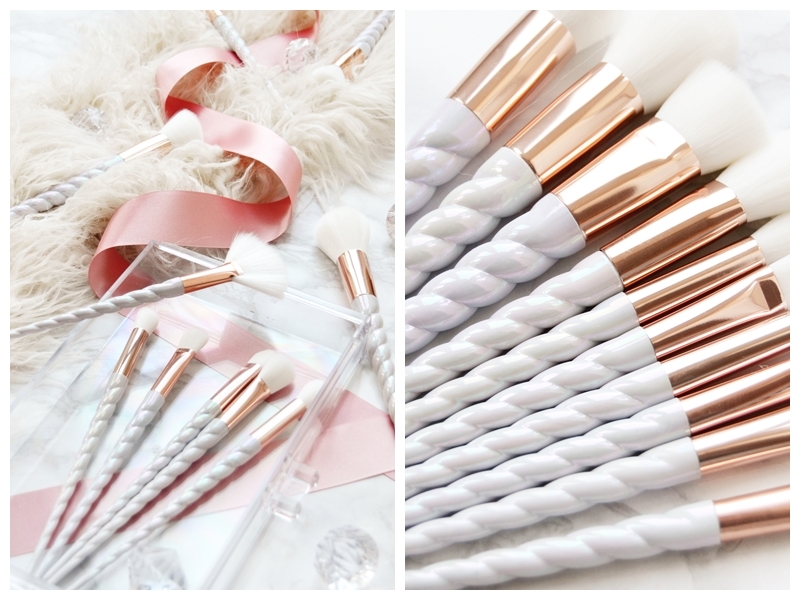 eBay Review: The Most Magical Unicorn Makeup Brushes for under £9! Over time, I feel I've become more knowledgeable about eBay and can suss out both good and bad listings/products. So I now have a high success rate when buying low-priced items from eBay and I'm generally always pleased with the items I buy. But sometimes a special product comes along and exceeds my expectations, it's rare, but it happens. And that's exactly what happened with this stunning brush set. It blew me away on aesthetics, quality and price! So obviously, I had to blog about it! 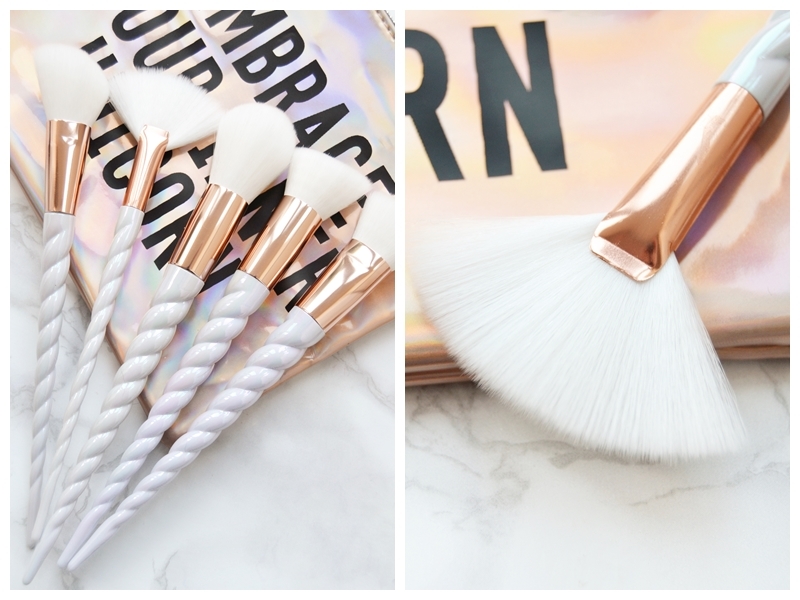 Side note - These Unicorn makeup brushes are actually from a UK seller with free p&p! Perfect if you're impatient and don't want to wait for international shipping. 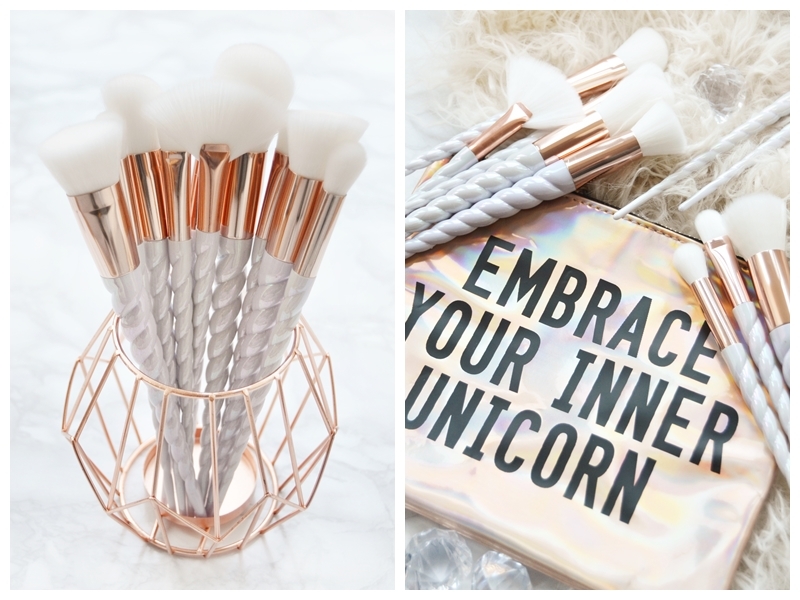 Buy the set of 10 Unicorn-inspired brushes for the current price of £8.69 HERE! FYI: I bought them at £8.99, so the price does fluctuate. The eBay listing doesn't contain any information on this, argh! However, having the brushes right in front of me I say you receive 5 face brushes and 5 eye brushes - a good mix. Face makeup brushes - Fan brush (just YASS!! ), angled blusher brush, flat-topped brush, fluffy powder brush, angled flat-topped brush. For me, these five brushes alone are worth £9 and really couldn't have impressed me more than they did! I'm so pleased a highlighting fan brush is including in the set and the powder brush is just amazing. A really good selection of brushes that are versatile and useful for someone that's into makeup. Eye makeup brushes - flat eyelid brush, larger flat eyelid brush, fluffy blending brush, larger fluffy blending brush, larger fluffy brush (too big for the eye area in my option). I'll be honest, some of the eye brush sizes are a little off; just too large for the purpose intended. However, 3 out of 5 are fine and the other 2 larger brushes that are also an ambiguous shape I will find some use for, possibly ok as concealer brushes, or give away. First of all, let's talk detail! I mean these brushes have character with so much attention to detail. As you can see the brush fibres are pure white, as white as it gets, and thankfully wash well! The ferrule of the brushes is a rose gold metal but looks even more amazing by not having a full-on shine to them, don't get me wrong they are shiny but just perfectly so. They basically don't scream cheap! As for the piste la resistance, the unicorn handles, they are just a thing of beauty (you can tell I love makeup brushes!). Twisted into a unicorn horn style, long, pointed at the end but not sharp, and lilac with the most amazing iridescent glaze, that's again there but subtly done. I couldn't be happier with how they look! As for quality, these are synthetic nylon fibre brushes, that's I'm sure a lot of you will be pleased to know. They are also the softest brushes, and I'm talking stroke over your face for no reason soft! Importantly there has been a little shedding of bristles, none when applying makeup and a minimal amount when washing them for the first time. I'm sure I will see some shedding over time, like a lot of brushes, but for now I'm more than pleased with the overall quality. The quality of the handles is also impressive, in fact they have the hidden benefit of being tapered so they are actually weighed to the ferrule end making for an easier application, especially when it comes to applying contour, blusher and eyeshadow. Oh, this is a tricky one because I've been loving the face brushes so much. The fan brush is without a doubt a favourite as it's so soft and light and perfect with powder highlighters, plus it came with a handy plastic brush guard so it won't get damaged when stored with other brushes. I'm also really enjoying the powder brush, again for its softness but it's just working so well with the Clarins Loose Powder I use to set my makeup. I've also been enjoying the angled blusher brush which can be used for both blusher and contour I've found. Lastly, I have one single favourite eyeshadow blending brushes that buffs everything out a dream. Actually now thinking about it, I may try out one of the other blending brushes to blend out concealer. Basically, I love a lot of the brushes in this set! Overall this Set of 10 Unicorn Makeup Brushes really has impressed me. I'd re-purchase them when they got past their best, buy them as a gift and recommend them to you. Any questions just ask away in the comments and I'll get back to you, but I think I've covered everything here! More eBay reviews to come very soon!